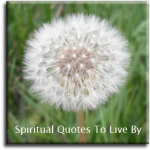 These friendship quotes and verse are all positive words of inspiration, that are uplifting to read through and appreciate those special people in our lives, they could also be used to let your friends know just how much they mean to you. 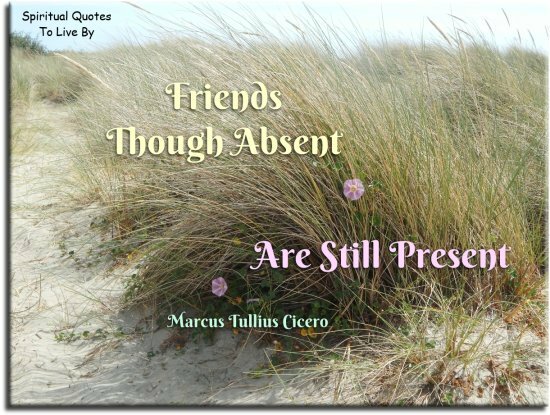 We all need friends to share life's trials and joys, especially the trials - as it is when we are struggling the most, that we find out who our true friends are. A friend is a second self, so that our consciousness of a friend's existence, makes us more fully conscious of our own existence. We should behave to our friends as we would wish our friends behave to us. the ease and discharge of the fullness and swellings of the heart. I thank you for my friends, for those who understand me better than I understand myself. For those who know me at my worst, and still like me. For those who have forgiven me when I had no right to expect to be forgiven. Help me to be as true to my friends as I would wish them to be to me. The Lord watch between me and thee, when we are absent one from the other. I looked for my Soul, but my Soul I could not see. I looked for my God, but my God eluded me. I looked for a friend and then I found all three. wanting ten-times more to tell you a loving lie. In loneliness, in sickness, in confusion.. The mere knowledge of friendship makes it possible to endure, even if the friend is powerless to help, it is enough that they exist. Friendship is not diminished by distance or time. Keep the door open so that lost friends can walk back into your life. Friends are too precious to waste. Don't walk in front of me... I may not follow. Don't walk behind me... I may not lead. Two may talk together under the same roof for many years, yet never really meet, and two others at first speech are old friends. Do not save your loving speeches for your friends till they are dead, do not write them on their tombstones, speak them rather now instead. There is a point when you aren't as much mom and daughter, as you are adults and friends. I touch people. I think everyone needs that. Placing a hand on a friend’s face means making contact. A friend is a person with whom I may be sincere, before him I may think aloud. The glory of friendship is not the outstretched hand, nor the kindly smile, nor the joy of companionship. It is the spiritual inspiration that comes to one, when he discovers that someone else believes in him, and is willing to trust him with his friendship. It is not so much our friends help that helps us, as the confident knowledge that they will help us. With every true friendship, we build more firmly the foundations on which the peace of the whole world rests. True friendship comes when silence between two people becomes comfortable. When someone has a strong intuitive connection, Buddhism suggests that it’s because of karma, some past connection. A true friend never gets in your way... Unless you happen to be going down. To know someone with whom you can feel there is understanding, in spite of distances or thoughts expressed, that can make life a garden. What trusty treasure in the world can countervail a friend? Our lives are filled with meeting wonderful people. Make sure those that have become a part of your life hear your words of appreciation. 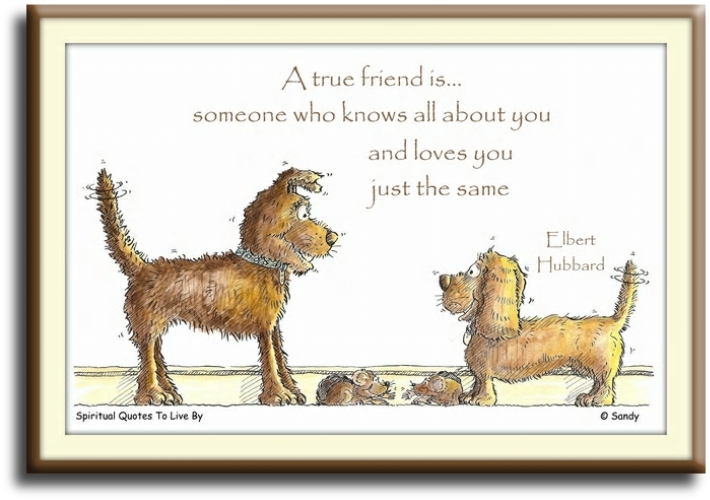 A true friend is someone who knows all about you, and loves you just the same. A mother is the truest friend we have, when trials heavy and sudden fall upon us she will endeavor by her kind precepts and counsels to dissipate the clouds of darkness, and cause peace to return to our hearts. Drink in the beauty of friendship. In this world of constant change, we need the comfort of friendship more than ever before. Friendship is precious, not only in the shade, but also in the sunshine of life; and thanks to a benevolent arrangement of things, the greater part of life is sunshine. Life experiences don’t come through machines.. That you get through people. 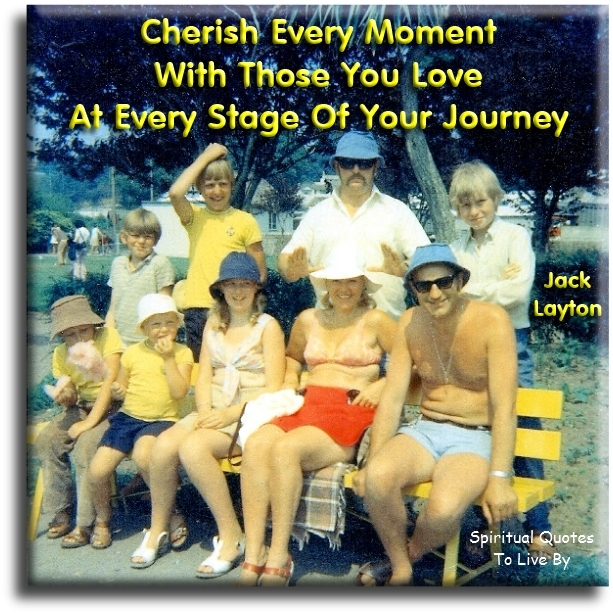 Cherish every moment with those you love, at every stage of your journey. Friendship is born at that moment when one person says to another: "What, you too? I thought I was the only one." Friendship is unnecessary, like philosophy, like art, it has no survival value; rather it is one of those things that give value to survival. Have I not destroyed my enemy, when I have made him into my friend? Is my mother my friend? I would have to say, first of all she is my mother, with a capital M; she's something sacred to me. I love her dearly... yes, she is also a good friend, someone I can talk openly with if I want to. The great thing about getting older is that you get a chance to tell the people in your life who matter, what they mean to you. We call upon all those who have lived on this earth, our ancestors and our friends, who dreamed the best for our future generations, and upon whose lives our lives our built, and with thanksgiving, we call upon them to… Teach us, and show us the Way. Nobody sees a flower, really, it is so small, it takes time, and to see takes time, like to have a friend takes time. Than a true, loyal friend and the warmth of a smile. No medicine is more valuable, none more efficacious, none better suited to the cure of all our temporal ills than a friend, to whom we may turn for consolation in time of trouble, and with whom we may share our happiness in time of joy. Friendship with oneself is important, because without it one cannot be friends with anyone else in the world. How rare and wonderful is that flash of a moment, when we realize we have discovered a friend. it is easier to play, it is easier to work. When someone cares it is easier to laugh. 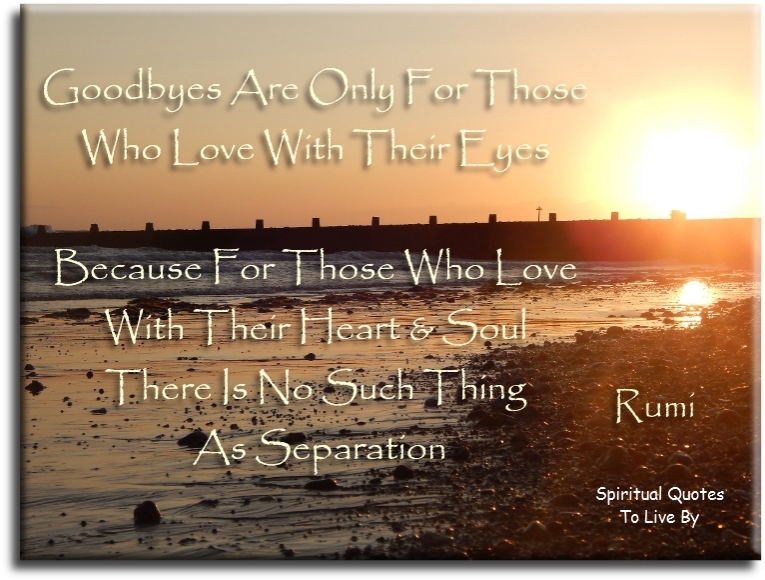 At times our own Light goes out and it is rekindled by a spark from another being. Each of us has cause to think with deep gratitude of those who have lighted the flame within us. In everyone's life, at sometime, our inner fire goes out. It is then burst into flame by an encounter with another human being. We should all be thankful for those people who rekindle the Inner Spirit. They've all taught me things about love and what that emotion really means. In a nutshell... loving someone is about giving, not receiving. Our one goal is to give the world a taste of peace, friendship and understanding through the visual arts, the art of celebration of life. No man is useless... while he has a friend. True friends visit us in prosperity only when invited. But in adversity they come without invitation. Friends.. They cherish one another’s hopes, they are kind to one another’s dreams. 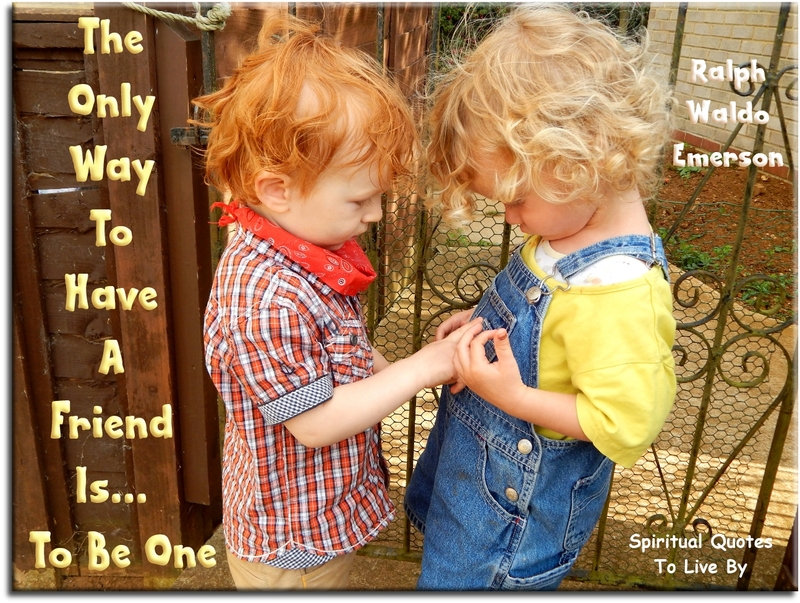 The most I can do for my friend is simply to be his friend. I have no wealth to bestow him. If he knows that I am happy in loving him, he will want no other reward. Is not friendship divine in this? Your friends are the one true note in the dissonant music of life. They are there to commiserate and console, to act as sounding boards and healing centres, but most of all, simply to be there when you need them. Learn and grow all you can. Serve and befriend all you can. Enrich and inspire all you can. To be rich in friends is to be poor in nothing. Treat other animals as friends and they become friends. Treat other animals as family and they become family. Give other animals your love and they will love you in return. 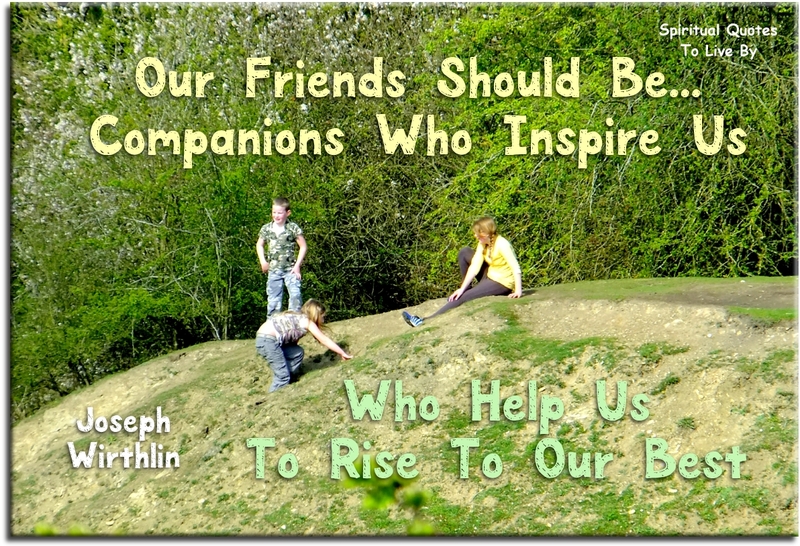 Our friends should be companions who inspire us, who help us to rise to our best. All friends are not for life, but if you have a true friend, you have a life. For all of us, whether we walk old paths or blaze new trails, friends remain important. There are no strangers here.. Only friends you haven’t met yet. Good friends help you to find important things when you have lost them... your smile, your hope and your courage.